Will Hollywood Look to Apple to Lead them out of the Amazon? Graham is a successful software developer and entrepreneur who started YCombinator to take advantage of the mismatch between the traditional venture capital business model and the realities of post-dotcom boom Internet startups. He concluded that SOPA and PIPA were symptoms of a large but dying industry that could do “a lot of damage to civil liberties and the world economy on [its] way down.” Hastening their demise would be both a broad public good, and a good business. Graham stated the problem broadly, asking entrepreneurs to think about what people are going to do for fun in 20 years, instead of what they do now. Graham sees the potential for continued growth in games, and other types of sites, but also sees alternatives to the ways movies and shows are currently produced and distrubuted. We believe 21st-century technology creates ways to make and share movies and scripts more easily than ever. Get noticed. Your work will be shared with a global community of filmmakers and fans, who can offer revisions and advice. Get your movie made. The goal of Amazon Studios is to work with Hollywood to turn the best projects into major feature films. They run monthly contests with cash prizes for writers and film-makers. Amazon Studios positions itself as a partner to Hollywood, but in thinking about it, I realized that Amazon already has Hollywood pretty much surrounded. Over the last 20-30 years, the overall importance of revenue from first-run TV, and movie box office has declined as a growing number of broadcast and cable TV channels created demand for TV show reruns, and revenues from movie rentals and DVD sales grew. Lately though, DVD sales have been declining, and BlueRay sales haven’t compensated, because more and more people are turning to digital distribution and streaming through Netflx, iTunes, and Amazon. In other words, the makers of TV shows and movies have long depended on Amazon for a significant amount of their revenue, first from DVD sales, and now, increasingly from digital downloads. The Kindle Fire was aimed squarely at enhancing Amazon’s position in this market. It’s also worth considering that Amazon uses free digital downloads as an incentive to get people to subscribe to Amazon Prime. On the other side, we have Amazon Studios, gets Amazon involved in the creation of new movies. They may be working with Hollywood, but part of their appeal is clearly to creative people who were, in one way or another, shut out of Hollywood. This is similar to how Amazon approached the eBook market. They did deals with publishers to get the rights to distribute books on the Kindle. To secure those deals, they surely used their position as a major sales channel for traditional books. Once the Kindle was off to a good start, they started enabling independent authors and small publishers to sell their own eBooks through Amazon. Now they are starting to do deals directly with authors, taking over the role of publishers for both vetting and editing books, and underwriting their creation with cash advances. So, how long before Amazon starts funding some of the movies themselves? It might take longer, because movies are more complicated to make than books. Also, theatrical release is still an important part of the movie business; box office receipts are an important revenue, and it helps generate the awareness needed to drive the sale of the digital downloads. Its also worth keeping in mind, that Amazon owns IMDB, which helps moviemakers find the collaborators they need to get movies made, and helps consumers find out about movies worth watching. All of this puts Amazon in a strong position vs Hollywood, but its even stronger if you step back and consider how important the book industry is to the movie industry. One of the most valuable film franchises in the last few decades has been the Harry Potter films, which, if it isn’t obvious, owes its success to the Harry Potter books. The same is true for many other films. The movie industry reduces its risk by drawing on successful books. Doing so gives them added confidence in the underlying story, and provides them with a built in audience, and built in cultural relevance. Unfortunately for Hollywood, Amazon seems likely to gain a favorable position for the film-rights for more and more books. This is good for Amazon, but also, I think, for Apple. Apple doesn’t encircle Hollywood in quite the same way Amazon does, but iTunes is an important distribution channel for movies and TV shows. Another thing Apple has is cash, lots of it. Movies are often financed, in part, by distribution rights. Wariness over Amazon’s position is going to drive the movie studios towards Apple (just as of fear of Apple’s power drove the record labels towards Amazon), Apple’s ability to help fund new movies and shows, in exchange for favorable distribution rights, seems like it will draw them even closer to Apple. This entry was posted in General and tagged amazon, apple, holywood, movies, ycombinator on January 22, 2012 by eas. Today Apple held an education-focused event where they announced a major upgrade to iBooks and iTunes U, the launch of a textbook initiative and a free OS X-only tool for creating rich, interactive iBooks called iBook Author. Apple has received both praise, and criticism for their efforts, but one criticism stands out. 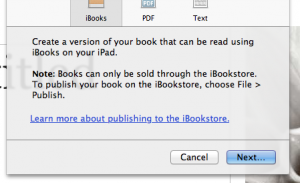 Dan Weinman called attention to a clause in the iBooks EULA which prohibits creators from selling anything they generate with iBooks Author anywhere but Apple’s iBookstore (they can give the books away wherever they’d like). This has made a lot of people upset, and brought some people to Apple’s defense. Apple’s defenders argue that it is perfectly reasonable that their Apple’s free software not be used to make a competitor money. That may be true, but it is hard to see this as anything but a small and petty move on Apple’s part. Apple offers the best ecommerce options for selling them? Further, and for the same reasons, how likely is it that the sales through that alternate channel would be anything but a drop in the bucket compared to what flowed through iBookstore? If, at some future date, Apple no longer makes the best device for viewing such content and/or, has serious competition for market share of iPad-class devices, and/or doesn’t have the best commerce system, then creators will have plenty of incentive to recreate their publications in order to get around this restriction anyway. In the end, I think the ill-feelings this restriction creates is more costly than any additional value it might help Apple capture. This entry was posted in apple and tagged apple, ibooks on January 19, 2012 by eas. I was reminded of this corny old joke when I heard that former Republican Senator, Chris Dodd, was critical of the way some technology companies were involved in a broad-based effort to defeat some odious anti-piracy legislation. In other words: “Corporate pawn, that’s my job!” It seems clear to me that Dodd’s concern is that it is going to be much harder for a guy like him to sell himself if, as he views it, people are just giving it away for free. I have a different, more optimistic take, which is that it is going to be far harder for organized, entrenched, minority interests to have their way when individuals and organizations can quickly assemble large collations to represent their own, shared, interests. This entry was posted in General on January 18, 2012 by eas. This website, like so many others today, has “gone black” to one degree or another to protest the Stop Online Piracy Act (SOPA) and Protect Intellectual Property Act (PIPA) bills being considered by congress. These bills have been bought and paid for by the lobbying wing of the entertainment industry. They are ostensibly about combating people who are profiting from the piracy of copyrighted material, like music, movies, and TV shows. There are many, myself included, who think these bills will do little to achieve that goal, but they are certain to hurt of Internet security, innovation, and free speech. Congressional supporters of the bills and the Whitehouse have started to recognize the power of public opinion against these bills, and may make concessions on their most odious aspects, but we need to keep pressing back, hard, because the supporters of these bills will keep pressing forward. Bills like this threaten innovation and the diversity of opinions and viewpoints the Internet enables. Irregardless of their specific provisions, they create an environment that make it harder for small, independent players, like this blog, to exist. Doing so reduces competition faced, more established, players. It also reduces the challenges to established political parties. I feel incredibly lucky to have grown up in the era of the personal computer, the Internet, and the limitless possibilities they afford. So much has changed in the past two decades, and I see room for decades more innovation and improvement in every aspect of our lives, but only if we can stop SOPA, PIPA, and similar attacks. The Electronic Frontier Foundation has provided tools for reaching your representatives. Rumors about the iPad 3 have been swirling around for months, but things kicked up again today after Blomberg reported that production has begun on the iPad 3 in preparation for a March launch. According to their three sources, the iPad 3 will have a double-resolution “retina” display, a new quad-core CPU, and the mobile data capability will be upgraded from 3G to LTE. If the report is accurate, these will be welcome, but unsurprising improvements. The retina display debuted on the iPhone 4, a few months after the first iPad shipped. Some hoped it would be a feature of the iPad 2, but there were good reasons it was impractical then. A higher resolution display is much more practical now and will provide a decisive improvement in the user experience. I’m not persuaded that a quad-core CPU is essential for a tablet at this date, but it does provide an avenue for improving performance. A faster dual-core CPU would probably provide a greater overall performance improvement, but I don’t know how practical that is. There is a new generation of ARM cores on the horizon that should deliver a big performance boost over the Cortex-A9 cores used in the iPad 2’s A5 CPU, but people don’t expect them to reach mass production until late this year. A big clock-speed improvement with the existing core design could provide a nice boost, and should be practical given the expectation that the new chip will be built on a 28nm process, compared to the 40nm process used for the A5. The long-shot in all of this is that Apple will release their own core design. An iPad with a retina display will demand a faster GPU, but whether this will come from a new design, or be achieved through higher clock-speed and improved memory bandwidth, remains to be seen. A bump from 3G to LTE is also a logical improvement, as carriers, led by Verizon, seek to recoup their investments in upgrading their networks to LTE. Apple avoided LTE in the iPhone 4s because available chipsets have horrible power consumption, but in the intervening 6 months, bring opportunities for new chips, and, perhaps more importantly, the power consumed by the cellular radio is much less significant on a 10″ tablet like the iPad, where the power consumption of the displays dominate. Will customers with 3G/LTE iPad 3s will be able to move them among various mobile carriers? The iPad 2 had different hardware depending on whether it is a Verizon or an AT&T model. The iPhone 4s is sold with it locked to a carrier, but the underlying hardware can work with both AT&T’s GSM-based network and with Verizon’s CDMA network. I expect future iPads to be similar to the iPhone 4s, with a single hardware configuration that can work with different carriers, but the iPad is sold without a subsidy, and the GSM iPads have always been unlocked, allowing their use with other GSM carriers. So, will carriers have to compete month-in-month-out to gain and retain iPad users? I sincerely hope so. I believe that the time will come where Apple has to pit the carriers against each other. For the iPhone, that time will likely come in a few generations, when the unsubsidized cost of the latest iPhone model drops to $300 or so. Is this the time for them to make that move with the iPad? This entry was posted in General and tagged A6, apple, ipad, ipad 3, LTE on January 13, 2012 by eas.